Alexander Kristoff (Katusha) won his third stage at the 2015 Tour of Qatar, holding off Peter Sagan (Tinkoff-Saxo) by a matter of inches on the line. Kristoff started his sprint from the very front of the bunch after his Katusha team had set a vast pace in the lead-out, but was forced to make his move a little early as the last domestique peeled off some way from the finish line. Sagan rode in the Norwegian’s slipstream and attempted to overtake him in the last 50 metres or so, but Kristoff, despite already having expended some effort, was able to hold him off. 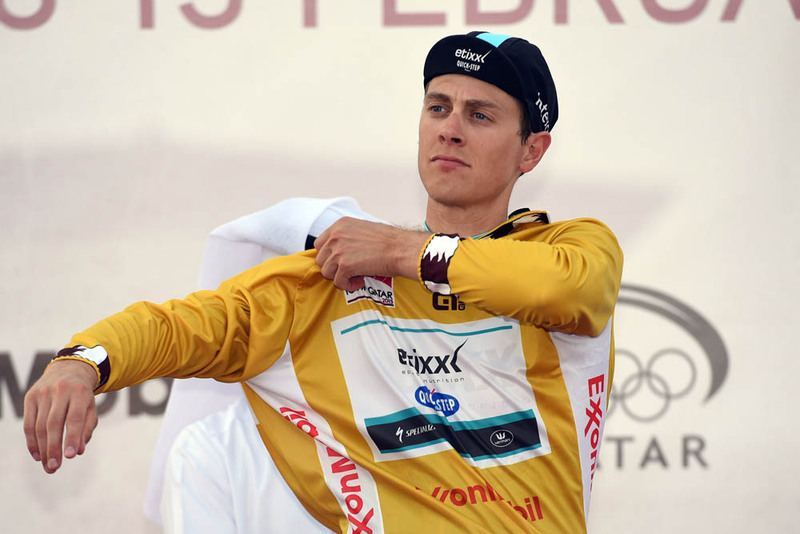 Niki Terpstra (Etixx-Quick Step) held onto the overall lead, though he suffered a scare with 6km to go when Katusha used the strong winds to force a split in the peloton. Kristoff and three of his domestiques, along with six other riders, managed to open a gap ahead of the peloton, and looked initially as though they would put time into the others – however, most of the favourites managed to haul themselves back into the lead group with 2km to go. The wind played a large part in proceedings all day long. There was action right from the start as the peloton split into groups, with second-placed overall Maciej Bodnar (Tinkoff-Saxo) caught out. A long chase ensued, but Bodnar’s group managed to make contact again with the lead group with 90km to go. Following the catch the pace in the peloton slowed, allowing a group of five – Ben Hermans (BMC), Marco Haller (Katusha), Jelle Wallays (Topsport Vlaanderen-Baloise), Dmitriy Gruzdev (Asanat) and Mathew Hayman (Orica-GreenEdge) – to break clear. They did manage to build up a lead big enough for Hayman to be virtual leader for a little while, but were caught with plenty of time to spare. Terpstra now has just one more day to hold off the challenges of Bodnar (still six seconds behind), a rampaging Kristoff (now third overall) and Sky’s Ian Stannard (12 seconds behind) to seal the overall win. Britain’s Luke Rowe (Sky) lost his lead in the best young rider’s classification as Sagan moves up to sixth overall. It was bad news for Lars Boom (Astana): the Dutchman was disqualified from the race for drafting behind a team car.